A studio image of two Chinese soldiers (local braves) produced probably in Hong Kong during the 1850s. Note the hudiedao (butterfly swords) carried by both individuals. The individual on the right seems to be carrying a single sword crafted in the style of a hudiedao, while the one on the left a true set of double swords. Unknown Photographer. I recently ran across two photographs that I think students of the southern Chinese martial arts may find very enlightening. They speak to interesting tactical and cultural questions. On the one hand they provide a record of how individuals fought and the specific weapons that they used. But on a deeper level they reveal subtle cultural trends that were effecting the martial arts of Guangdong during the 1920s and 1930s, a key period in their evolution and development. The martial arts have long been associated with military training and local defense. These links, however, are more complex than they first appear. From at least the time of the Song dynasty officials were able to make an increasingly clear distinction between the martial arts as a social practice (predominantly carried out by civilians) and actual military skills (as practiced by soldiers). The two areas were seen as clearly distinct, if still related, fields of studies. One might lead to a career in the other, or it could lead to a number of other things. And that was the problem. Many of the activities of martial artists tended to be less than savory. During the Ming and Qing dynasty opera and other street performers were often associated with the martial arts. These rootless individuals were looked down on by most elements of society. Other martial artists got jobs as military escorts or guards for local businessmen or property owners. The state was not always enthusiastic about the creation of independent pockets of military power controlled by these sorts of free agents. Finally, a disproportionate number of martial artists seem to have run afoul of the law and ended up as bandits or pirates. Surely some of the accounts of the associations between martial arts schools and criminal organizations are exaggerations, but there is a disturbing grain of truth behind many of these stories that needs to be acknowledged if one really wants to understand the place of the martial arts in Chinese society. This reputation for links to the criminal underground was one of the main sources of tension between martial artists and mainstream society in Hong Kong during the 1970s and 1980s. I have recently heard some disturbing reports that the same sort of reputation is starting to reemerge in the current era as more Chinese parents are actively discouraging their children from taking up the traditional arts. Robert J. Anotony discusses one of the common strategies employed to deal with the problem of wayward tough kids (often with some training in boxing and weapons) in his monograph Like Froth Floating on the Sea: the World of Pirates and Seafarers in Late Imperial South China. When the piracy or banditry problems flared up in Guangdong one of the first things that the local government often did was to start hiring “braves” (basically independent mercenaries) to stiffen the local regiments and to organizing village, clan and gentry led militia units. This was not an entirely new strategy, though the south did tend to embrace it with a particular enthusiasm. During the 1510 Rebellion a Confucian statesman named Yang Yiqing (1454-1530) proposed a strategy for containing the spread of the violence by actively absorbing into the state as many under-employed young men with military training as was financially possible. He petitioned the throne to authorize the Minister of War to hire civilian volunteers for limited terms of service (most of the Ming army was hereditary at that point) and to institute a special set of military exams that would select civilians who possessed great strength, archery skills, the ability to ride, and martial artists who specialized in the pole, spear, sword, chain or unarmed boxing as well as those who had studied military texts. These individuals were to be recruited on generous terms, payed and equipped well, and given low-level leadership posts, such as being named a “military trainer.” The suggestion of Yang and others were accepted and this strategy became a common practice for dealing with security concerns during both the Ming and Qing (David Robinson, Bandits, Eunuchs and the Son of Heaven, pp. 84-85). Both Robinson and Antony point out that there is one critical element of Yang’s plan at is often missed by modern readers. Rather than just bolstering local defense, Yang was really attempting to engage in direct economic competition with local bandits chieftains, rebels leaders or invaders who might also wish to employ the services of these same young men. Creating extensive militias in times of crisis not only gave the state a valuable source of reserve troops, but it also made the situation less volatile by controlling a large and unpredictable set of actors. It is critical to understand this so that we can really grasp the full relationship between martial arts training and militia service in southern China during the Qing dynasty. From at least the Ming period on both the state and society were making increasingly clear distinctions between the martial arts as a civilian social institution (which was sometimes implicated in low level violence) and the actual business of warfare (which involved rifles, cannons, fortifications and massed cavalry charges). Yes knowing some boxing could be an asset to military training. Knowing pole or spear fighting would be even better. But martial artists were intentionally sought out for recruitment into militias in large part because of their social marginality. This was a crowd that was overwhelming young, it worked cheap and local leaders were worried about what they might do if left to their own devices. Putting them to work for the duration of the crisis seemed to be a good idea. This brings us to our first picture. This photograph probably dates from the 1850s. The photographer or circumstances of its creation are unknown. It was probably taken in Hong Kong some time after the First Opium War (and likely after the Red Turban Revolt), but prior to the Second Opium War. The two “soldiers” in the photograph look to be teenagers. I suspect a disproportionate percentage of local militia recruits during both the Ming and Qing were likely very young adults. There certainly seems to be some demographic issues at play here that need to be more fully explored in a future post. Obviously this photograph was taken in a staged studio setting. Still, the uniforms, helmets and weapons are very real. The models look to be quite real as well. While a recreation, this is probably the most accurate and detailed representation of mid 19th century Cantonese militia members that I have ever seen. 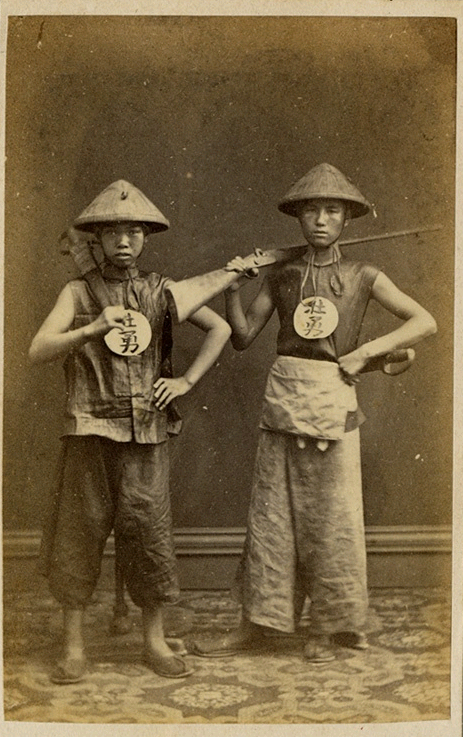 Both boys are wearing a rough uniform that includes a dark tunic, shoes, a helmet and a label which reads “zhuàng yǒng.” Translated literally these characters mean “strong and courageous,” but a more colloquial reading might be “valiant” or “brave.” The uniforms, standardized weapons and the labels suggest that these individuals are mercenary martial artists, usually referred to in the historical literature simply as “braves,” who were so common in this period. Its interesting to note that both of these individuals have been issued hudiedao as part of their “official” gear. One individual carries this weapon as a sidearm accompanying his rifle, while in the other case they are the primary arms. This matches quite closely the written descriptions of civilian troops from the period which we previously reviewed here. We can now compare this photograph with another image of a militia unit. This image clearly shows a local village militia group somewhere outside of Guangzhou. Maybe it would be better thought of as a martial arts class that has been dressed and used as a militia. These “soldiers” appear to be shockingly young. A local village militia group outside of Guangzhou, probably in the mid. 1850s. Source http:\\www.swordsantiqueweapons.com. This village militia does not seem to have the same level of economic support as the “braves” hired in the major urban areas. Most of the soldiers are without shoes, they have no semblance of uniforms, and their weapons vary greatly. However, it is interesting to note that the leader of this group is clearly carrying a set of hudiedao (butterfly swords), and other photographs in this series suggest that the individuals with the shields are as well. 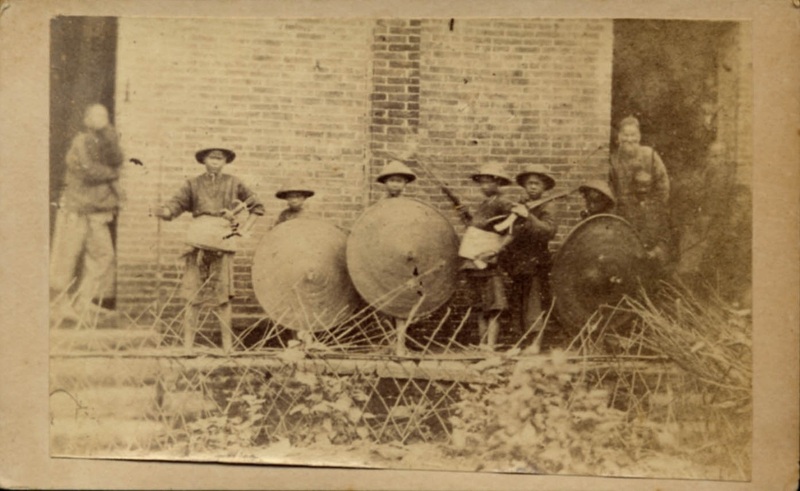 These two photographs represent two different elements of the late Qing militia strategy. The first set of soldiers are likely youths from a city (sometimes referred to as “urban toughs” by local officials) who were likely involved in boxing and were recruited into military service directly by officers of the state. The second photo shows a much more organic group. These youths were likely part of a crop-watching society or martial arts class in a small village. There is a very good chance that most of these kids are related to each other (either as siblings or cousins). During a time of crisis a local landlord or degree holder would recruit multiple groups such as this, and organize them into a fighting unit. This force would be supplied and coordinated through the gentry led militia system. The standardized helmets and shields (as well as the presence of some rudimentary firearms and hudiedao) would seem to indicate that this organization had already happened, but there is no sign of the larger military or social structure that this unit is supposed to be embedded in. Guangdong Militias of the 1930s and 1940s. The martial arts continued to be associated with the formation of militias and the defense of local communities in the 1930s. While hand combat was quickly disappearing from the battlefield, these skills remained an important part of the repertoire of local militia men. In fact, there is a notable change on this front from the pattern that we just reviewed 100 years previously. In that case the government was free to recruit martial artists in large numbers. They did so both to bolster the number of fighting troops at their disposal, but also as a means of temporarily strengthening their control over local society at a potentially sensitive and volatile time. During the 1930s and 1940s most residents of urban areas had no martial arts training. It appears that many of these individuals were first introduced to the martial arts when they joined a local militia group, or “Big Sword” (Dadao) training class to help to defend the nation. The Nationalist Party consciously used the martial arts (regulated though their Guoshu program) as a means of strengthening the people, both physically and psychologically. In the countryside these steps were less necessary. Farmers still had to form crop-watching societies, bandits still plagued the roads and the martial arts were a popular pastime in a number of agricultural communities. In short, the situation for many of the province’s rural martial artists was not markedly different in 1940 than it had been in 1840. The greatest difference between the time periods would be the sudden increase in urban middle class martial artists that started to be seen in the 1920s. Yet most people still lived in the countryside, and there life went on pretty much the same as always. As such you might guess that the sorts of militias, technologies and weapons used would be pretty similar. This turns out to be only partially true. It is still the case that most peasants could not afford to buy a rifle, but the rifles that were seen in the 1940s were overwhelmingly bolt action designs. While their state of repair might be variable, they were actually broadly comparable to what the average Japanese infantryman might carry. Those members of the militia and rebel groups that could not be armed with guns still carried traditional weapons. The following two photographs are very instructive in this regard. 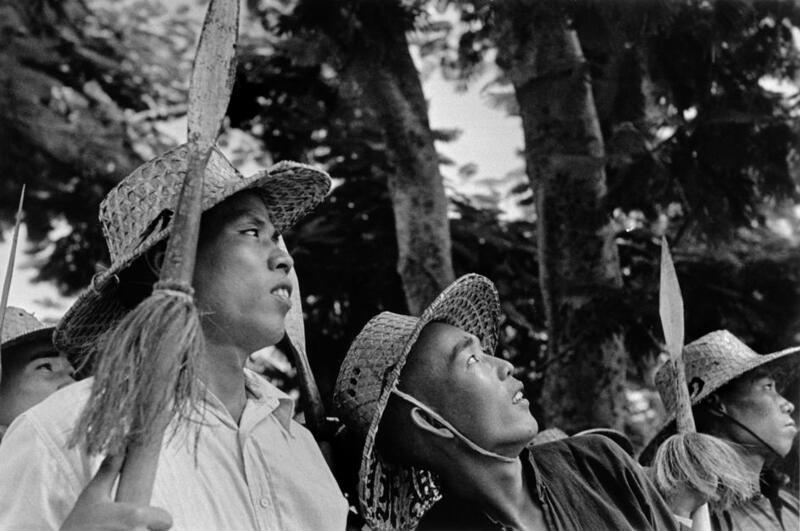 The first of these was part of a series of images of a rural militia group organizing outside of Guangzhou in 1938 taken by Robert Cappa. Other images in the same series can be seen here. Member of a local militia outside of Guangzhou, 1938. Source: Vintage war photography by Robert Capa. I quite like this image for a variety of reasons. First and foremost it is simply an excellent photo that humanizes its subject. That is something that many early western photographers of China utterly failed to do. It seems that they took their task to be the illustration of “difference” rather than an exploration of our shared humanity. On a more mundane level this photograph also offers one of the most detailed studies of actual spears from the 1940s that one is likely to ever see. The nature and construction of the spearhead is clearly visible. Again, some individuals in this unit are armed with rifles, and the others carried spears. For all of their actual practicality, spears are not the weapon that most people associate with the patriotic martial artists of WWII. That honor would go to the “Dadao” or the “Military Big-Saber.” These large two handed swords are the most iconic weapon to emerge from China during the early 20th century. I discussed the origins and social history of these blades here. While a few regular units were issued this weapon and organized into “Big Sword Teams,” its important to remember that the vast majority of the regular KMT army was armed just like any other modern military of the time. They were issued bolt action rifles, semi-automatic handguns, grenades and sub-machine guns. I have spent quite a bit of time searching old books and photo archives for good images of soldiers with dadaos in the field (as opposed to in a photography studio or on a parade ground), and I can tell you that such images are rarer than one might think. They certainly exist, but finding good shots is a challenge. Most of the individuals who were issued these weapons were in fact second line troops such as militias, rural guerrilla groups, military police units and railway guards. Issuing traditional arms to these groups freed up more advanced weapons for those soldiers actually fighting the Japanese. Further, these groups actually spent the majority of their time securing villages, protecting fixed assets and dealing with Chinese civilians. In those settings a dadao was both very intimidating and very effective. Again, this is not to say that there were not a few important battlefield clashes where dadao were used, but those instances are remembered precisely because they were the exception rather than the rule. For the regular army the dadao seems to have functioned as a moral boosting weapon. Those individuals who actually used it in anger tended to be concentrated in guerrilla and militia units. 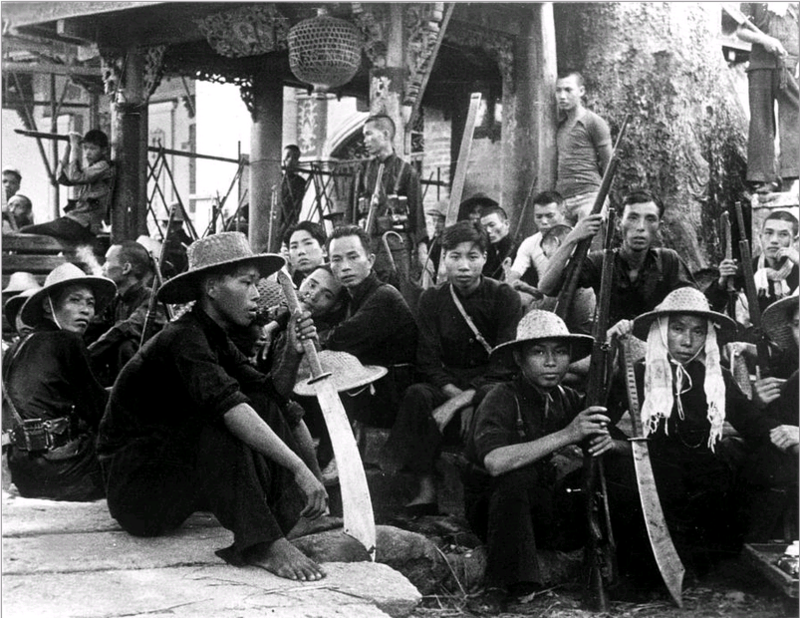 A Chinese guerrilla team armed with rifles and dadaos near Guangzhou in 1941. Source: Vintage War photograph, Everett Collection. The preceding photograph was taken of a group of Chinese guerrillas who were actively resisting the Japanese outside of Guangzhou in 1941. I have not been able to figure out who the original photographer was (though I have a couple of guesses). The individuals in the image are dressed in the almost universal garb of insurgents in Asia and are armed with a variety of weapons including modern and older firearms, and dadaos. A number of interesting features of these blades are visible. To begin with both of the blades in the foreground have holes in the back of the spine near the tip of the blade. On civilian swords these often contain a brass or metal ring. In the current case I suspect the hole is meant to hold a cord or a sling so that the sword can be worn across the back. Note that neither sword appears to have come with a scabbard. The sword on the right also shows an intricately wrapped handle. This contrasts markedly with the sword on the left. While the blades appear to be absolutely identical, its handle has a plain cord wrap. Given the humid wet conditions of southern China, period handle wraps in good condition are rare. This photo yields some interesting evidence as to what these swords looked like and how they were used in the early 1940s. On a deeper level it is interesting to ask why these troops are armed with dadaos at all. At first glance this seems to be a very “traditional” weapon inherited from the ancient past. Yet that is mostly an illusion. While militia forces from the area traditionally did use a variety of different types of swords, the dadao was not one of them. There are no accounts of troops using these sorts of swords against the British in Guangzhou in the 1840s. At that time chopping weapons were common but they were always mounted on longer poles (pu dao) giving the wielder the advantage of leverage, speed and reach. Instead the hudiedao seems to have been the favored sidearm of martial artists and militia members in the region for much of the 19th century. During the 1840s and 1850s the government purchased huge numbers of these arms and trained thousands of people in their use. Double swords really were an “official” weapon of local government backed paramilitary groups. That may seem odd from a modern perspective. We tend to treat butterfly swords as a highly exotic “Kung Fu” weapon. They are regarded with an aura of supernal mystery. But the truth is that if you already know how to box, its not that hard to give someone the rudimentary training they might need to use this weapon effectively. Additionally the hudiedao were small enough to be treated as a sidearm that would not get in the way of a bow, rifle or spear (the primary arms of most local troops). Given that the militias of the 19th century were actively recruiting martial artists and boxers, issuing hudiedao made a lot of sense. By the 1930s this weapon had vanished from the battlefield. Southern martial artists still practiced with it, and criminals occasionally employed it on the streets for their own nefarious reasons. However I have never seen any indication that militia groups in Guangdong continued to use this familiar local weapon. Instead most of them seem to have issued the dadao, a fundamentally different two handed saber from the north, as the predominant sidearm. It would not be too difficult to teach most peasants to use a dadao as they all used two-handed tools in their daily lives. Then again, many of these same peasants were already martial artists, swords were common, and very few individuals in southern China used double handed blades. Introducing a totally new type of bladed weapon seems to be a needless complication. Nor am I really convinced that the dadao was adopted simply because it could be made “cheaply and easily by anyone.” Cheaply perhaps. But given how heavy and clunky some of the dadao are that I have handled, their production must not have been all that “easy” for some facilities. If the provincial government could produce somewhere between 3,000 and 10,000 hudiedao in the year 1838-1839, I am not sure why the much more efficient and industrial government of 1937 would not have been able to do the same thing. Far from being a “traditional weapon,” the dadao is really better thought of as a new invention in the 1920s and 1930s. While swords of this type had existed in the past they had never been issued on such a massive, near universal, scale. Nor had they ever been asked to do so much. The dadao succeeded not only because of its low price, but also because it reminded individuals of a mythic time in the past when the country was unified and strong. Specifically, it reminded them of the Ming dynasty, when China had defeated the Japanese twice. The dadao became a successful national icon only after it was imbued with these meanings. It was adopted into the universalizing and modernizing vision of the Central Guoshu Institute and from there it was exported to southern China precisely because it spread these norms and identities. Any sword could do what the dadao did in purely physical terms. Many probably could have done it better. Yet the image of the guerrilla savagely resisting the Japanese with his trusty dadao became a touchstone in the national discussion of resistance and identity. And that is precisely what the martial arts were supposed to do under the guidance of the Central Guoshu Institute. They were supposed to strengthen and unify the people. Can we then conclude that the dadao is an example of the export of a northern martial art and set of concepts into the southern hand combat marketplace? Does its presence, popularity and wide scale adoption in Guangdong indicate a broader acceptance of, and standardization on, the northern martial arts in the 1930s? Did this indicate that the traditional southern arts were seriously damaged by the various northern led reform movements that swept through the nation’s martial arts in the 1920s and 1930s? Not necessarily. It is true that the residents of southern China signed up for “Big Sword” classes with as much enthusiasm as anyone else. But the entrepreneurial martial arts teachers of the south treated this new weapon as a way of drumming up interest in the martial arts more generally. I have never seen anything to indicate that they viewed it as a threat or resisted its importation. In fact, southern hand combat teachers were some of biggest material beneficiaries of the creation of Big Sword units and militias throughout the region. Various police and military academies had to hire local martial arts instructors to teach dadao classes. Very often these same schools had full time martial artists from the north, but these individuals were already quite busy teaching the “official” military, police or Guoshu curriculum. The inclusion of additional material was thus an economic windfall for well connected local martial artists who competed for these side-jobs. Not only did they come with a government backed paycheck, but they were an important way of networking and connecting with students from other parts of society. One could even use these sorts of appointments to forge connections with various police and military officials, as was demonstrated by Cheung Lai Chuen, the creator of modern White Eyebrow, during his stint as a “Big Sword” instructor. These teachers turned to their own stores of local knowledge to develop their own curriculum and style for “Big Sword” instruction. Just as the physical details of these swords tend to differ from specimen to specimen, so to did the techniques and forms developed by different local matters. For instance, in the south instructors from Choy Li Fut, Hung Gar and White Eyebrow all developed their own dadao techniques and trained their own students. Presumably each of these styles drew on the martial insight of their respective styles. The move from the hudiedao to the dadao in the Guangdong militia is interesting as it demonstrates the limits of what the Central Guoshu Institute could really accomplish in terms of promoting a modern universal standard of practice based on the northern martial arts. Even in areas of the country where they were represented and could openly operate (mostly the coastal urban zone), their actual presence on the ground was pretty thin. While they were able to craft a discourse and create the demand for certain types of knowledge and services, as often as not it was local martial artists who provided the actual training. This was especially true when it came to the vital task of drilling militia and paramilitary groups. On the surface it appears that the adoption of the dadao by China’s martial artists in the 1930s was a universal phenomenon. But if you scratch beneath the surface it becomes apparent that even this trend was really reinforcing the local and the particular.